The University of Maine at Presque Isle will present David Sylvester—a cyclist, award-winning filmmaker and best-selling author—as the first guest speaker in its 2016-2017 Distinguished Lecturer Series. Sylvester will deliver his talk on Tuesday, Sept. 13, at 7 p.m. in the Campus Center. The event is free and the public is invited to attend. During his talk, Sylvester will discuss his mission to better the world one hug, one high-five, and one interaction at a time. Sylvester began his mission after the loss of his life-long friend, Kevin Bowser, in the attacks on the World Trade Center on Sept. 11, 2001. Since 2002, Sylvester has biked across North America, Asia, Africa, and Australia spreading his message of positivity. 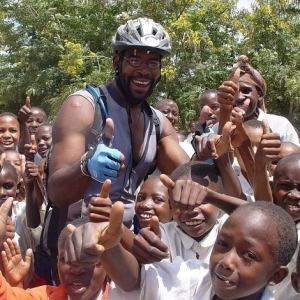 Sylvester has gone on six major bicycle rides across continents and countries around the world. 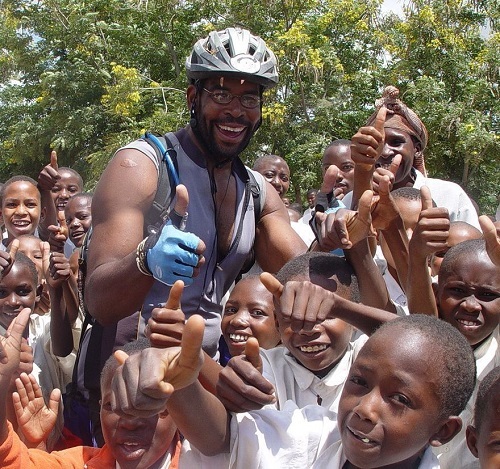 As he ventured forth on these bicycle rides, he did charitable work in the cities he visited. Sylvester has traveled from: Washington State to Philadelphia, Cairo to Cape Town, Istanbul to Beijing, San Diego to New York City, Minneapolis to New York City, and from Sydney to Melbourne. Sylvester was planning on biking across South America, but all of that changed when he was in a car accident. He was hit by a driver who was under the influence of alcohol, antidepressants, and marijuana. A two-inch knob from the car got lodged into his knee in the crash, and he was told he would never be able to run again. He defied all the odds to continue his pursuit of helping others by spreading positivity and raising money for different charities. Sylvester has been featured on ESPN.com and dailyadvertiser.com.au. He also delivered the 2015 commencement speech at California State University in Northridge, and has spoken at colleges such as: Yale, the University of Pennsylvania, Brown University, and the University of Vienna. He wrote his best-selling book, Traveling at the Speed of Life, in 2012 about his cycling trips. The book has been added to several high school and college curricula across the United States. Sylvester was born and raised in Philadelphia, Pa., and attended Temple University. All are invited to attend Sylvester’s Sept. 13 talk. For more information about this event, contact the University’s Community and Media Relations Office at 207-768-9452.